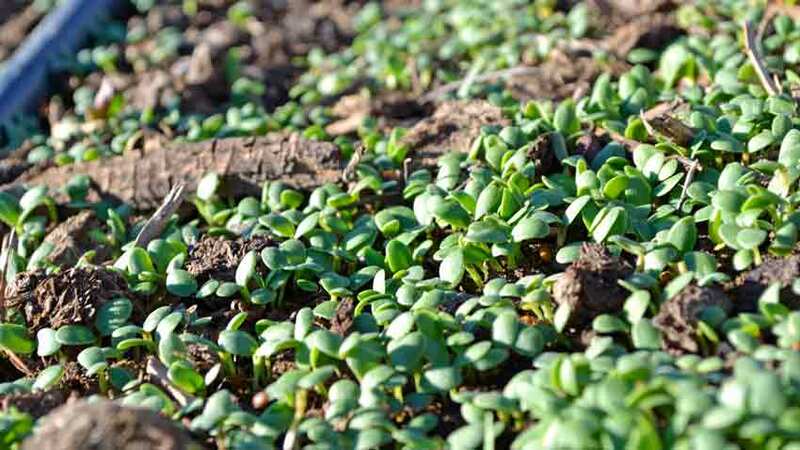 Can cover crops improve garden soil in one month? 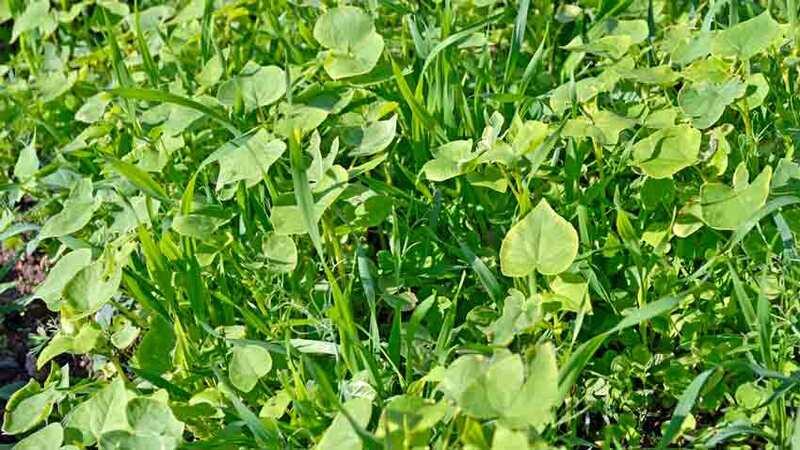 Cover crops – also called green manures – have improved soil for thousands of years. 3,000 years ago Chinese agriculture began planting horsebeans and sesame for soil improvement. 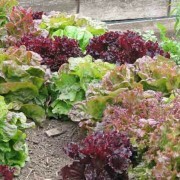 Much later the Greeks and Romans sowed special crops to increase soil fertility. 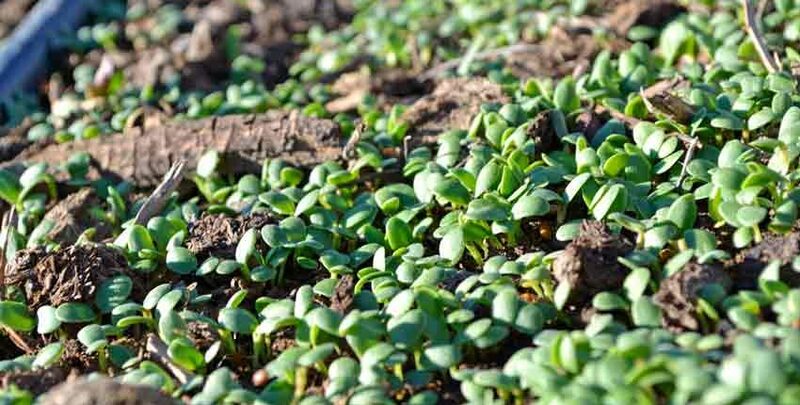 The past 60 – 80 years has seen an incredible amount of knowledge emerge from small farmers experimenting with planting different cover crops and learning from what resulted. This knowledge was built on a foundation of several hundred years of European trial and error. 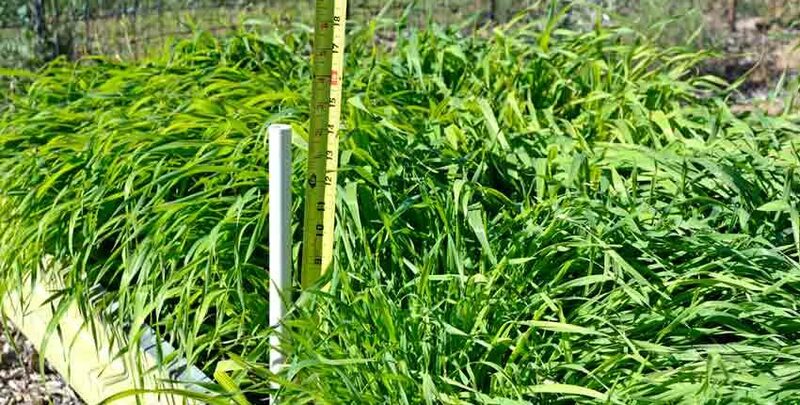 We now have access to detailed information about how to use cover crops for the maximum benefits in our gardens, pastures and fields. 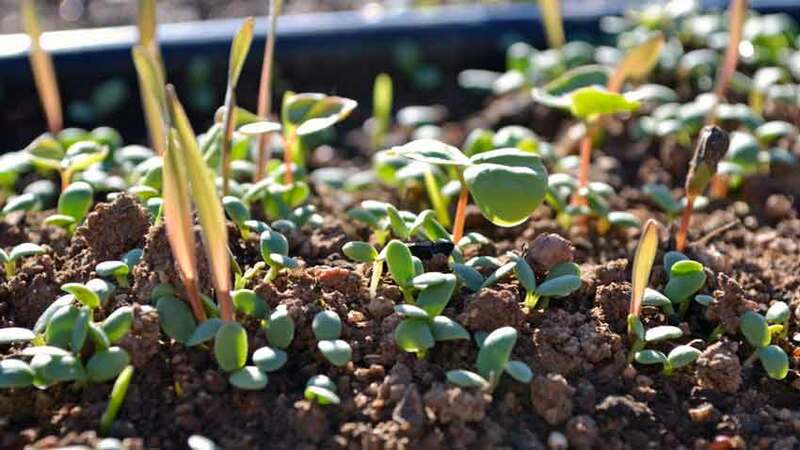 Our Garden Cover Up Mix was developed from research into the specific benefits we wanted to bring to the home garden soil, as well as what species supported each other. 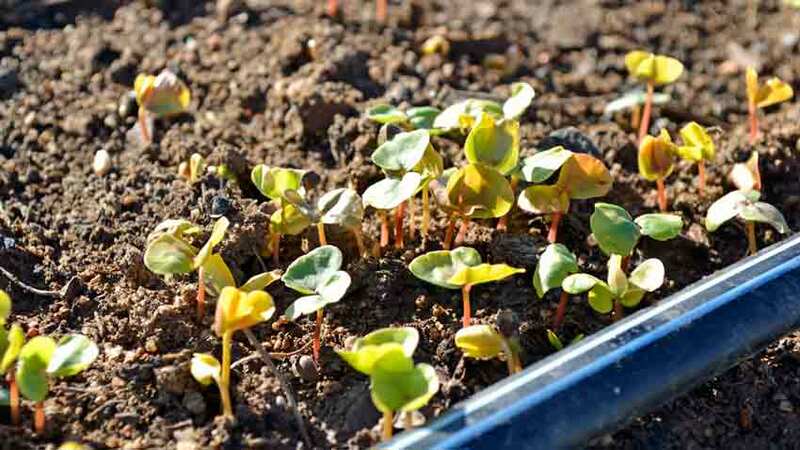 This photo essay is a look at what one month – 4 weeks – of growth provides in an average raised bed. After sowing we began watering with our drip system, but the monsoon rains provided a good amount of water over the month. This helped the plant growth along, so your results may be a week or two behind these photos. 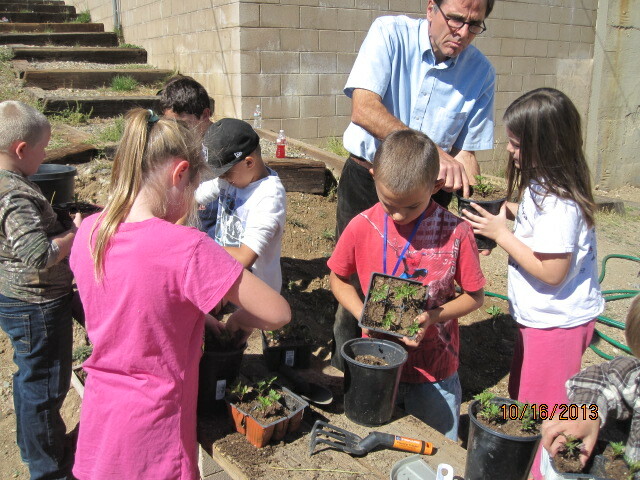 At one week, the mix has almost all sprouted and shown vigorous growth. 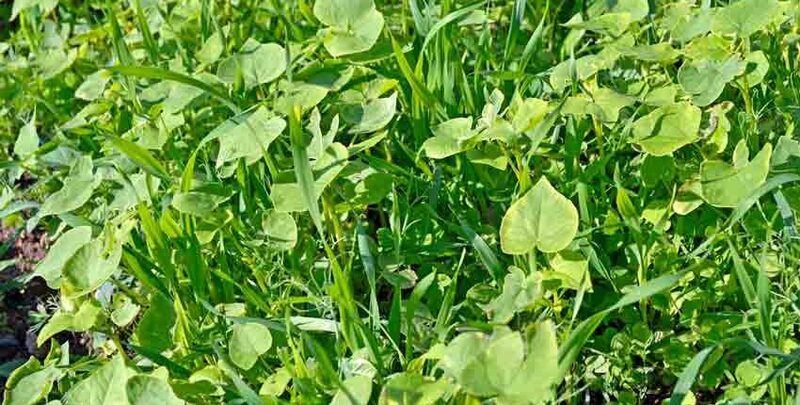 The oats and rye are shooting up, looking like grass while the buckwheat spreads its leaves and the clover hugs the soil. The peas were just beginning to show up, as they took a few days longer to absorb moisture and begin germinating. We planted the different parts of the mix separately to get an idea of how they grew by themselves and with other species in support. 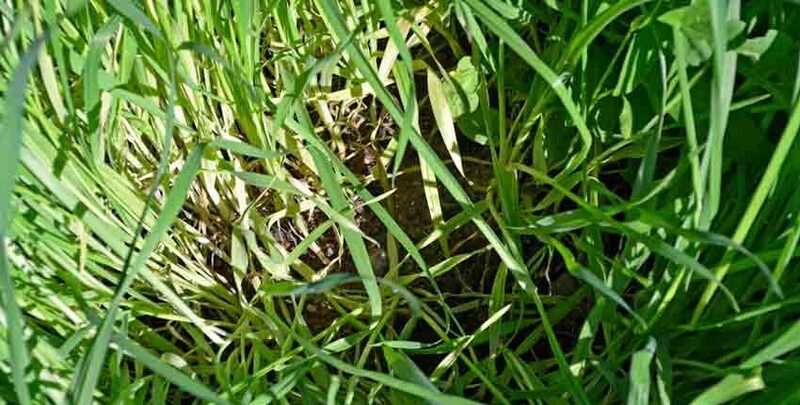 The rye and oats both shot up rapidly, germinating within 3 – 4 days and showing good soil coverage. 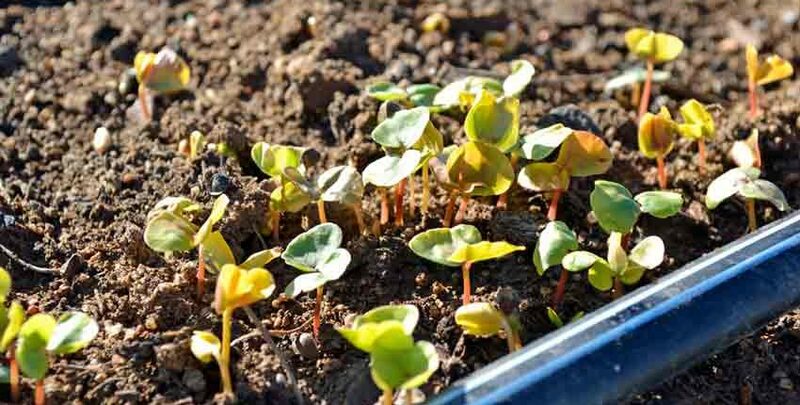 The crimson clover was also up fast, creating a fluffy green blanket over the soil with its tiny green leaves. Even with only an inch of growth it was easy to feel the temperature differences between the tops of the leaves and the soil temperature – it felt like 15°F difference! The buckwheat was a couple of days slower coming up than the oats or rye. Once the sprouts appeared they immediately opened their leaves and really started growing. After three weeks the mix has almost completely covered the raised bed. The root system is about 3/4 of the top growth at this point, so the root density below the soil is almost as much as seen here. This is why cover crops are so beneficial to soil fertility. A closer look shows how much shade the soil has and how thick the mix is growing. 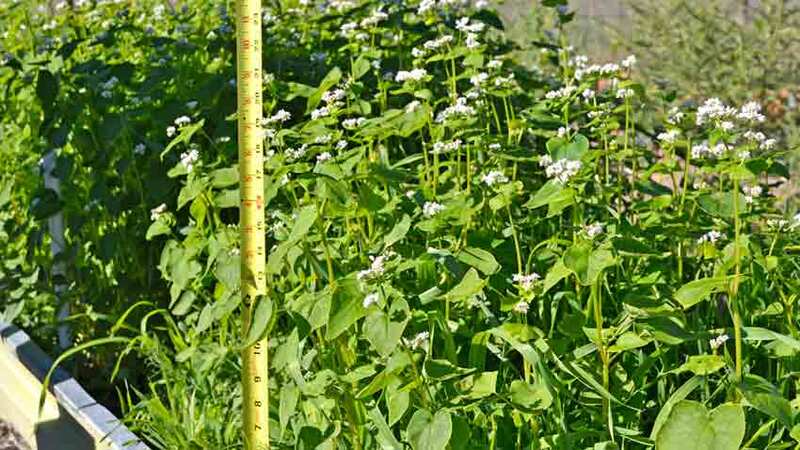 This out-competes most weeds above the soil while the roots choke out weeds below. The young seedlings have just finished emitting auxins, a natural root hormone that inhibits other seeds from growing. 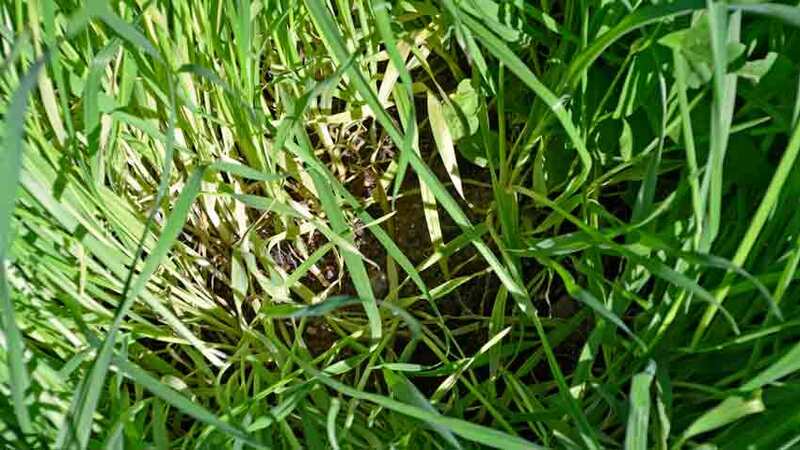 This mechanism gives the cover crops a head start over any other weeds for the next 2 – 3 weeks. When weed seeds can’t germinate, they will often rot as the soil fertility improves. The growth accelerated going into the fourth week, as these photos show. The white PVC stake is about 14 inches tall. Last week the growth was about 3 – 4 inches, but this week it shot up above the top of the stake. Besides putting on a lot of height, the mix also completely filled in the raised bed. Weeds have no space to grow and we could only find one or two after searching for them. The soil is much cooler than the surface of the leaves. It is also moister, but that could be due to the amount of recent rains and not the cover crop. 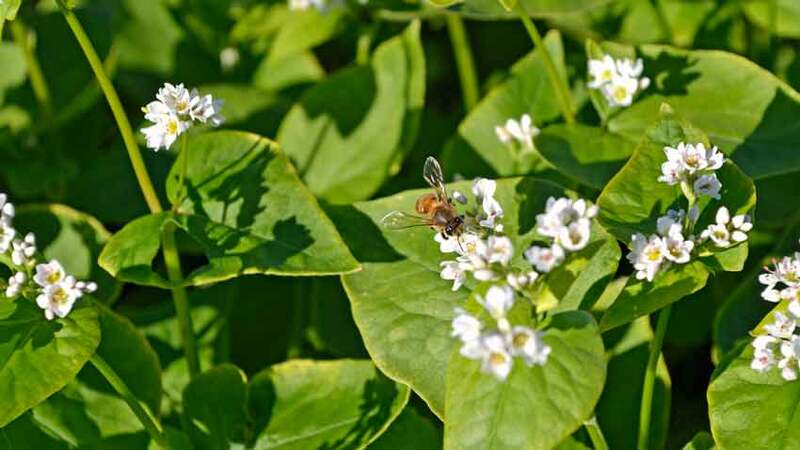 The buckwheat is starting to bloom and is attracting bees as seen in the top photo detail. 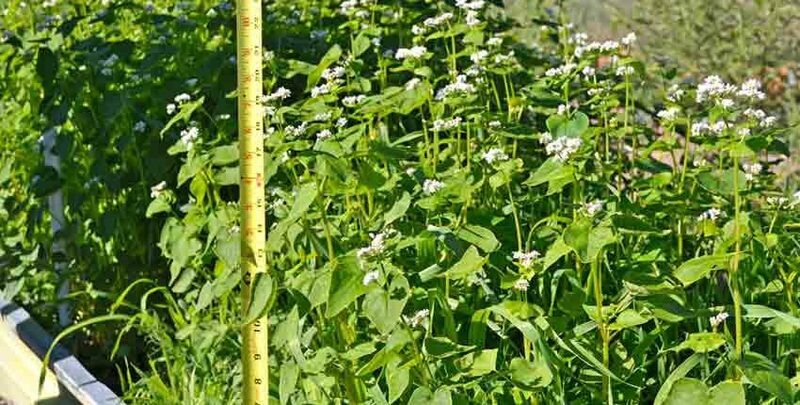 The buckwheat is the tallest of the mix at about 21 inches tall. The mix is extremely full and thick up to about 16 inches, completely choking out any weeds. The root system is still about 3/4 of the height of the plants, so there is an amazing amount of roots below ground! This shows why planting cover crops does so much to improve the physical structure of the soil. 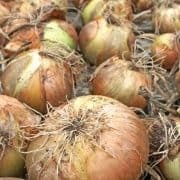 As the roots die and decay they add organic matter to the soil, open up moisture and air pathways where the roots grew and increase the carbon content – all at the same time! Pretty good for a few minutes spent planting the seeds and a months’ worth of growth! Both the rye and oats look like really lush grass. They completely cover the soil and top out at just over 15 inches at one month. We couldn’t find any weeds in this test plot. Looking closer at the density of the rye planting, it is easy to see why weeds don’t stand a chance. There is no room for anything other than the rye with this dense seeding rate, which is the point. If a killing frost happened tomorrow there is enough growth to create an excellent mulch while the root system will feed the soil and its microbial populations. Our first frost is still several weeks off so the cover crops will keep growing both above and below the soil level. The flowers need watching to prevent setting seed and creating another crop next season. We will clip or mow the flower heads as they develop if there isn’t a frost soon enough. 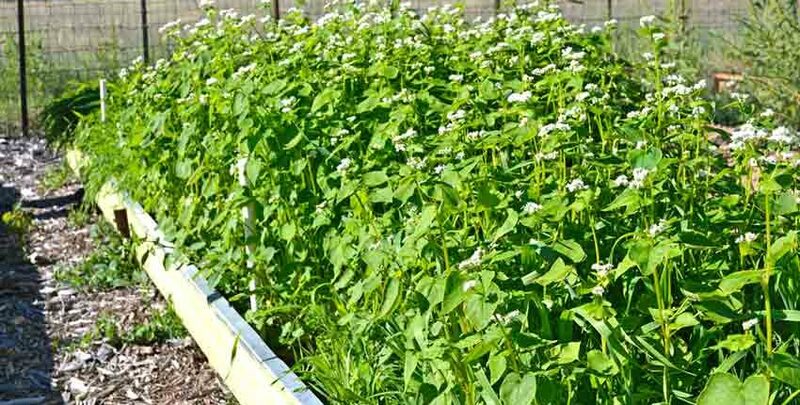 If the rest of the mix can develop before mowing or a killing frost, it gives more nutrition and benefits to the garden bed. 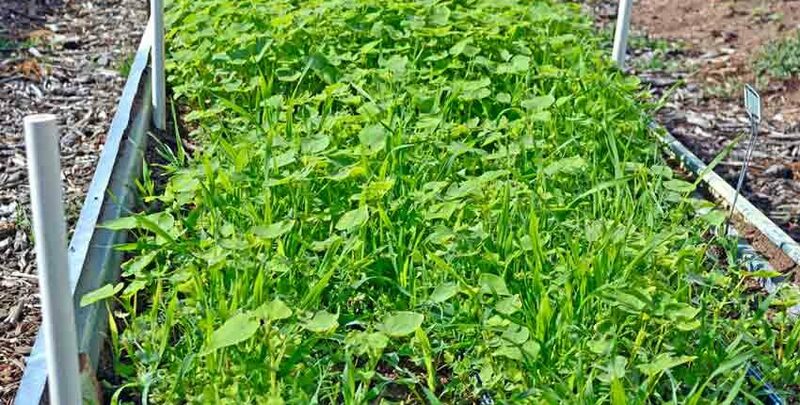 Cover crops will increase the bio-available nutrition in your soil for next season, even if you use a well-aged compost. Both approaches have benefits but if used together support each other and create a better, more fertile soil sooner than if only one is used. 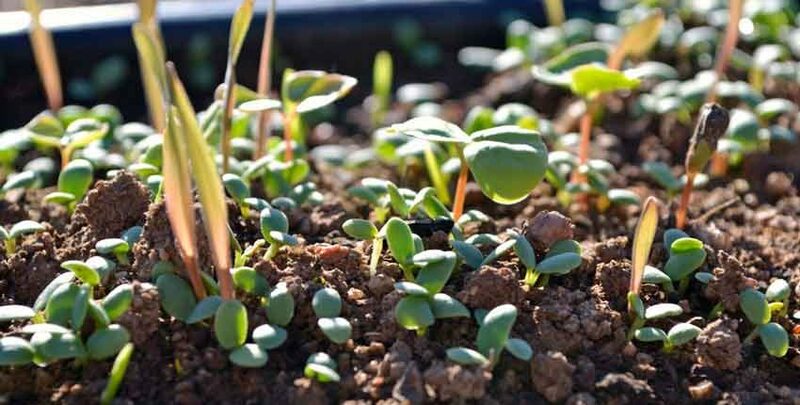 You don’t need a lot of time to grow a good cover crop and seriously improve your garden soil – a month will do! 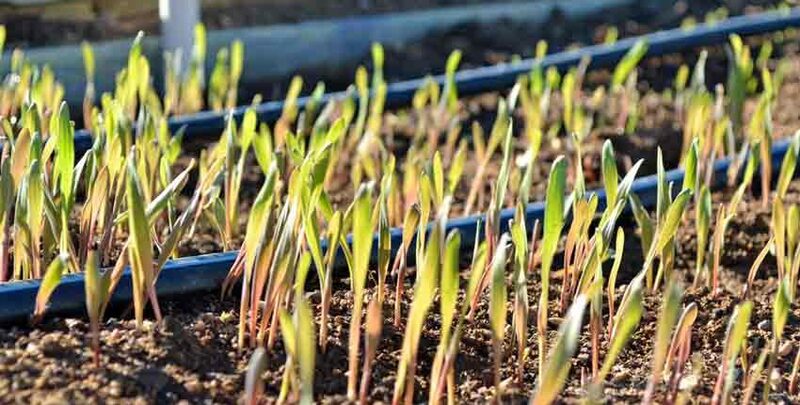 Even if you only have 2 – 3 weeks you will be better off with a shorter planting than none at all. Go plant some cover crops. 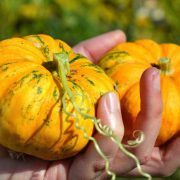 Your garden will reward you handsomely next season! 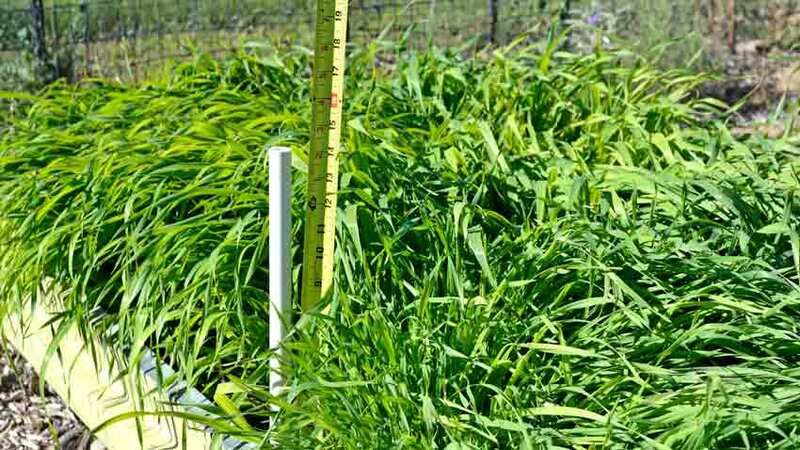 Find your cover crops here! I just want to say thank you for all the great information and the quality products. I have gardened for over 40 years and I still learn something new every time I read one of your articles. 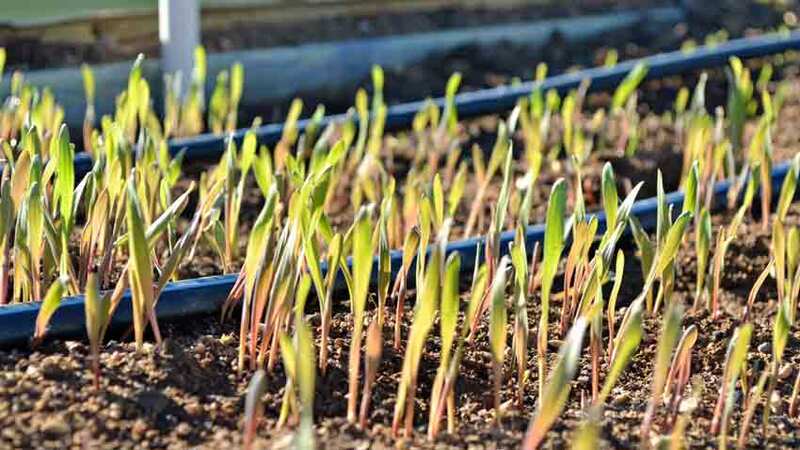 I will be attempting to use a cover crop on my raised beds and our grain field (corn and wheat) to improve the soil as other attempts have been disappointing. Thanks for the kind words Jo! 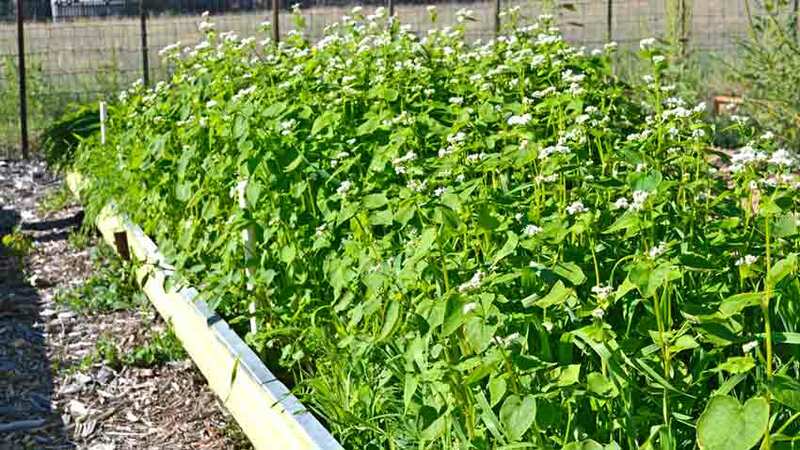 Please let us know how the cover crops do for your raised beds. 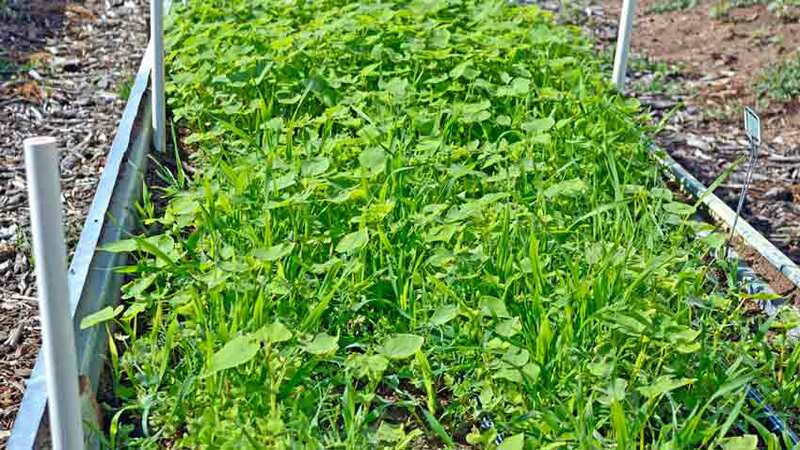 How do you utilize the cover crop when you’re ready to plant your veggies? With Fall-sown they recommend chopping it all down at the base and letting it lay for a couple weeks (this is when the nitrogen the plants have taken from the air, is released by the roots. I think? 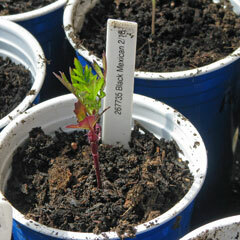 ), then planting the starts right through the chopped down (not chopped “up”!) tops, which are breaking down by then. What i am wondering now is, how to i cut the 2′ high mixture of field peas, vetch, rye, to begin my crops (home garden)? Should i chop it in with a spade? And if so, how long before planting? Or should i chop at the base, lay down the tops, and plant through? I decided to plant in spite of the late start when i read your article, so thanks for that, but now it seems i dont know the next step. This fall i will plant the cover crops in October, pray for rain, and get my soil ready for work next Spring. Chuey, do the same for spring-planted cover crops as with fall-planted. Cut the stalks at the base, then if you wish, chop them into the soil to decompose faster. You can transplant into the chopped mulch in about 2 weeks and direct sow in about 3 weeks.